The heart of Weston Thermometers is the helix-sensing element. The Weston helix is more than just the "run of the mill" sensing element, for Weston's exclusive fabrication assures long-term accuracy (up to ± 1/2 % of the entire scale). From the very beginning of the formation of the bimetal helix, to its careful sizing and aging to eliminate inherent stresses, to its shock mounted inclusion in the stainless steel stem, every Weston thermometer has the built-in stamina to give years of dependable and accurate service. The pointer is driven directly by the sensing element-no pivots or complicated linkage mechanisms are used. Liquid column separation and leakage are problems of the past when you specify Weston all metal thermometers. Abnormal operating conditions, which may temporarily swing the pointer beyond the end of the scale, will not impair the thermometer accuracy. 50% overswing on ranges up to 500°F and 10% for ranges of 500°F to 750° F as well as 50% underswing on all ranges are well within the safe operating limits of the bimetal element. The bimetal principle of temperature measurement eliminates the need for gases, liquids or capillary connections. Since Weston thermometers are of all-metal construction, breakage and maintenance are materially reduced. 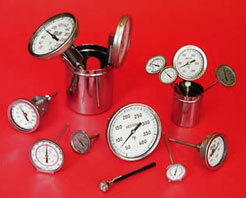 All thermometers are calibrated with standards directly traceable to the National Bureau of Standards. The thermometers listed in this site have been designed to provide accurate and dependable temperature measurements for industrial and laboratory applications. Their rugged all-metal construction, exceptional readability and proven reliability all combine to assure maximum service. Weston thermometers are available in a variety of ranges, sizes and types for the usual industrial and laboratory applications. All-metal construction with corrosion resistant stainless steel stems and connection nuts assure long, dependable service. No pivots, complicated mechanisms or parts are used. The absence of gears or connection links, factors which tend to introduce errors and frequently result in complete failure, eliminates wear and friction. The 304 stainless steel stem and connection nut on industrial models have been tested at 1000 psi. It is recommended, however, that on installations involving high pressure, wells be used in accordance with standard thermometer practice, thereby providing additional insurance to the installation. Thermometer connection nuts have National Pipe Threads. Easily mounted at any angle for convenience in reading. Heating, Ventilating, Air Conditioning, Etc.